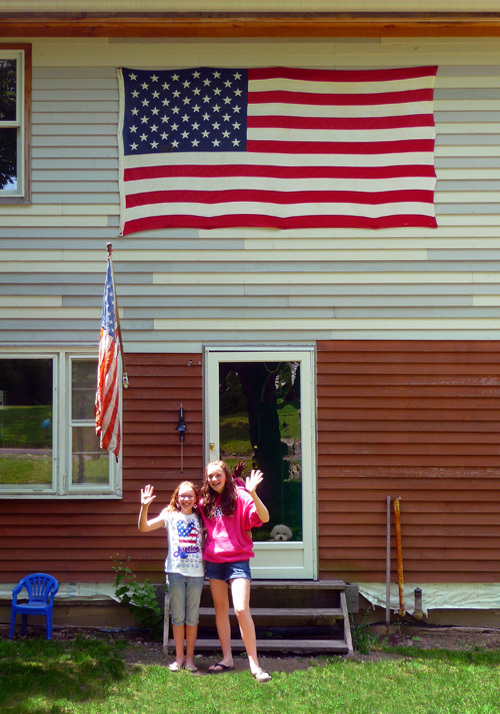 Erin and Shannon's father, John, took time out from re-siding this house on King Street this morning to nail up an American flag in celebration of Memorial Day. While the girls wave to me, their dog, Seamus, peeks out the window. ike many familes in our neighborhood, John, his wife, Sherie, and their daughters will spend part of the holiday tending their homes and gardens. New Englanders are famous for their frugality, and with the economy ailing this year, a lot of us would sooner catch up on our work than run around spending money. You can tell these are children of Baby Boomers. Erin wears a Peace and Justice T-shirt; Shannon, a hot-pink sweatshirt that she picked up while visiting the U.S. Naval Academy in Annapolis, Maryland. Elsewhere on my walk today, I met children racing bikes and scooters, waved to half-a-dozen motorcyclists, smelled broiling steaks and burgers, heard horseshoes clanging, and felt a blessed sunshine on my head and a refreshing breeze at my back. As I walked down Middle River Road, I spied a white-haired man of about 80 shuffling out to his mailbox. I stopped and asked him, "Are you a vet, too?" "You betcha!" he said, shaking my hand. Ronnie (that was his name) stood at the curb for a few minutes while we compared notes on our military service. He served in the Army in Germany in the early 1950s; I was an Air Force computer technician in the late 1960s. Like many vets these days, we both complained that our troops haven't been getting a fair shake lately. After bidding Ronnie goodbye and continuing my walk, however, I did some fresh thinking on this. Finally, although the GI Bill helped me finish college, it covered only a small fraction of my tuition. Today's educational benefits are much stronger. I'm not complaining, mind you. Money and respect weren't the most important things I gained from the military, anyway. The Air Force taught me self-discipline, teamwork, and above all, the relentless pursuit of excellence. Those are priceless. About this page: Precisely at noon each day, I step out of my office for a 3.5-mile walk around my neighborhood in Danbury, Connecticut. I carry a Panasonic Lumix DMC-TX5 pocket camera with a Leica 10x optical zoom lens. My object is to make an interesting photograph of at least one thing that is different that day. I post the results here, hoping they will inspire you and your friends to walk, too. —Terry Dunkle, DietPower founder and CEO.